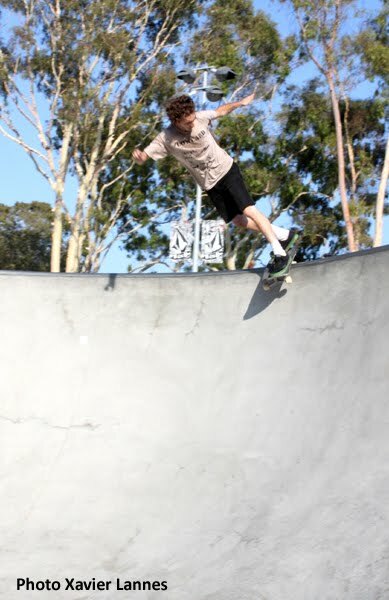 Screech - Josh Sandoval at Volcom Skate Park. Pool skateboarding is surrounded with hype and nihilism. Everybody wants to ride pools, a lot claimed they did it but only a handful of riders are part of the closed group. Same thing with pool skating films. There was Chlorine, (with Steve Alba, Dave Reul, Brian Patch, Steve Cabellero, Sam Hitz, Omar Hassan, Darrell Delgado, Steve Olson, Dave Hackett, Tony Alva, Lance Mountain), shot over two years, this pool skating documentary, covered all of the aspects of backyard pool skating as it is today, from driving around, jumping fences, draining pools, getting busted and features skating from pool skating's greats. There was also Steve Payne’s “Fresno,” about one Central California town’s housing crisis and the pool skaters who couldn’t be happier about it, and two films by the skater-director Josh Henderson, “Cancer Dust” and “Block Party,” which intercut thrilling action sequences in cities hard hit by the economy (Phoenix, Fresno and New Orleans make appearances) with shots of wipeouts, open wounds and general drunkenness. There have been somber shorts (“Cannonball”), action-only compilations with the subprime-mortgage crisis as a backdrop (“A Badlands Adventure”) and countless self-produced YouTube videos. And of course, many people got their first glimpse of backyard pool skating in the 2002 documentary “Dogtown and Z-Boys,” by Stacy Peralta, a recollection of the 70’s when a record-setting drought had emptied swimming pools throughout the region, and imaginative locals found that they made awesome skate parks, though often illegal ones. Three decades after the Z-Boys, pools across the state are bone dry again, this time thanks to thousands of foreclosed, abandoned homes. With all those empty backyards has come a resurgence in the sport and, over the last three years, the rise of a new kind of skater film, one that looks and feels nothing like “Dogtown”. Gaining the most notice and critical acclaim is “Dragonslayer”. The film charts a year in the life of Josh Sandoval, aka Skreech. Winner of the best documentary prize at this year’s South by Southwest and Hot Docs festivals, “Dragonslayer” is a tale of young love and skating mayhem set against the recession-wracked suburbs of Central and Southern California. Including tracks from indie darlings like Best Coast, Jacuzzi Boys, The Soft Pack and Thee Oh Sees, the film’s soundtrack is a new age punk score that fits the film’s tone and mood like a spiked glove. As much a brooding mood piece as the film, the soundtrack is a perfect fit for this film, which itself is best described as a thesis on both life, and the lack of control one truly has over it.